Set of two high quality clay fired pizza stones and a wide bodied pizza paddle. Suitable for BBQs and Electrolux 90cm and 60cm ovens. Can be used both indoors and outdoors. The Electrolux Pizza Stones are designed to create quality pizza crusts each and every time. Having two stones, means you can use both stones at the same time in a 90cm oven. Or use one stone outdoors in the BBQ and the other indoors in your Electrolux 60cm oven. 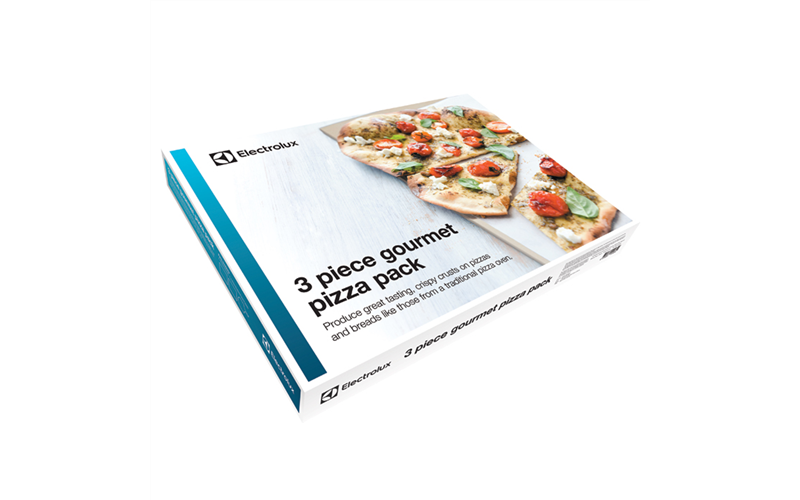 The Electrolux Pizza Pack contains a wide-bodied wooden paddle so you can easily add and remove your pizza from the hot stone. Unlike traditional spatulas, which are short and narrow, this well-designed paddle can safely lift the pizza off the pizza stone without losing any of the precious topping. From a Gourmet Pizza Pack to protective weatherproof covers, our broad range of optional extras can help you create your perfect barbecue. Plus, whether you prefer an open grill or a solid hotplate, our range of customisable cast iron furnishings offers different cooking configurations to suit your needs.